:Do you long for depth and authenticity in your relationship with God? Do you want purpose and daily direction but can t seem to find the right prayer to receive it? When the Soul Listens will guide you away from formulas and step-by-step prayer plans toward contemplative prayer, the lifestyle that allows you to experience God's presence, writes author Jan Johnson. Learn to find rest and guidance in God, opening yourself to God's presence and direction through this practical approach. 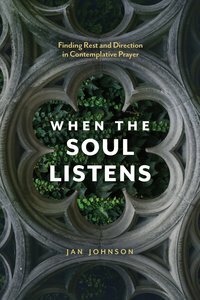 About "When the Soul Listens: Finding Rest and Direction in Contemplative Prayer"
Jan Johnson, a spiritual director and a frequent speaker at retreats and conferences, is based near Los Angeles, California. She is the author of numerous books and Bible studies, including Enjoying the Presence of God, Growing Compassionate Kids and When the Soul Listens. She is also co-author (with Dallas Willard) of Dallas Willard's Study Guide to the Divine Conspiracy and Renovation of the Heart in Daily Practice. Her most recent books are Invitation to the Jesus Life and Spiritual Disciplines Companion.